It’s a true “plug-and-play” IT infrastructure building block – flexible, easily scalable and cost efficient. Additionally, it features an optional built-in cloud gateway, in order to utilize public cloud storage tier where appropriate. StarWind HyperConverged Appliance is turn-key virtualization appliance built from best of breed components. With a single support umbrella approach, it is extremely simple to manage and requires minimal effort from IT operations. StarWind HyperConverged Appliance is the most affordable turn-key virtualization solution available in the marketplace today. Due to its designed and intelligent use of hardware, less hardware is required bringing a “sum of all the parts” cost benefit. StarWind HyperConverged Appliance unifies best of breed hardware and software from proven vendors: servers from Dell, Flash from Intel, virtual shared storage from StarWind, Microsoft or VMware, Microsoft Hyper-V or VMware vSphere hypervisor and industry-leading VM backup from Veeam. It delivers enterprise-class performance without cost, risk or complexity. Robin Kirmeier, a company representative. Marian Danisek, IT infrastructure & Operations Manager, Tajco Slovakia s.r.o. It's superfast and super reliable, exceeding all set requirements. Running now for the third year 354/24/7 with zero downtime. With StarWind Virtual SAN, we have obtained a very powerful and scalable DR solution with high availability. We selected StarWind because it met all our requirements and was a good value for the price. We went with all flash in our StarWind storage solution and were able to greatly exceed our backup RPO because of the increased performace. We chose StarWind mainly because of the cost compared to other vendors. Simplicity of setup was also a major factor and I like the fact that you don’t need a vendor certified engineer to perform the installation. Bosch VMS got Highly Available infrastructure, using StarWind Virtual SAN to build Microsoft Hyper-V Failover Cluster. Moreover, Bosch achieved redundancy and fault-tolerance of the security system with lowered power consumption and reduced implementation operational and capital expenses. StarWind Virtual SAN software coupled with Mellanox Ethernet-based high speed end-toend infrastructure accelerates storage solution networking connectivity and lowers overall power consumption. We are happy with the way StarWind is Performing and it currently meets all our requirements. We would not hesitate in recommending StarWind our clients. StarWind is robust, willing to work with us and had faster response than other companies. StarWind VSAN has done us well and I would certainly recommend it in my future career. What we found especially valuable about StarWind is that it provided us with fault-tolerant software-based high performance storage pool. StarWind worked well since it went into production and the whole configuration leaves room for the planned future expansion and adjustments. The deployment provided increased performance with reduced costs and the same ease of management. We used to focus on stability and now we will give full attention to. We will definitely consider StarWind for future deployments, especially because of low hardware requirements and flexible configuration. StarWind seemed the easiest and most straight-forward system to implement without tight storage limits for entry-level systems. We plan on continuing to host the ESXi servers datastores using StarWind Virtual SAN. The stability has never been an issue, not even a single hiccup. This is a product I would highly recommend especially in the SMB market where budgets are always tighter and utilizing hardware for multiple purposes makes the management very happy. Baker Tilly Ukraine was really impressed by StarWind from pricing, performance and ease-of-use perspectives. It was unequivocally the best choice of the six products that we evaluated. The simplicity, reliability and performance are unmatched, especially when you consider that the pricing comes in less than the competitors. After one year in production service, we'd easily and readily recommend StarWind's software to any server admin looking for a robust and cost-effective SAN, without the single point of failure or proprietary operating system of a hardware solution. StarWind Virtual SAN is deployed in AIDA (Aerosol Interaction and Dynamics in the Atmosphere) research facility to ensure high availability of scientific data. The result is a total success with approximate uptime of 99.9986301% and just one hour a month downtime due to planned maintenance. StarWind Virtual SAN provided high performance and 24/7 data availability for scientists from every time zone to continue their research non-stop. We strongly recommend StarWind solution. Since our initial deployment our storage needs have grown and the product has successfully grown with us. We have increased our storage exponentially without any complications. We can now perform maintenance on our storage cluster without creating an outage. StarWind's solution is simple, scalable and reliable. I love how it works with VMware and really important for me, it's affordable. This setup has been bullet-proof for the last 18 months and the performance was for the most part better than expected. We have been very impressed with Starwind Software and have deployed it in a variety of similar configurations successfully since this project. We have tried different storage system solutions to obtain data synchronization and redundancy, but most of them didn't provide the real-time synching that we required. Then we tested StarWind, and even tried to "sabotage" it but it just kept working! StarWind meets all our needs and has taken a prominent place in our IT environment. The whole process from evaluating the product and discussions with StarWind technical staff to final purchase was straightforward, helpful and in no way did I ever feel forced to purchasing the product. This is the first class product and company. Combining StarWind and Veeam is one of the best IT solutions that we have seen in years. We got affordable networked storage, increased application and data availability, protected our VMware infrastructure and were able to do all this for less than 25% of what we initially budgeted. No other solutions came even close to the product quality and cost which we got with StarWind and Veeam. 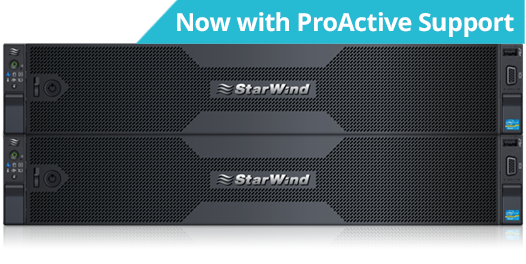 With the StarWind solution, Reseaunance obtained reliable SAN with advanced features. The StarWind storage solution offered security for our data. It can be scaled according to the company’s storage needs with promised zero downtime and fast disaster recovery. Data deduplication technology was exactly the thing we required, because it permits us to store a large amount of data without extending our existing storage. Tudor Rose Management deploys an efficient StarWind-based converged IT infrastructure to meet growing workload demands. Because of my investment in StarWind’s fantastic HA solution and Microsoft Hyper-V clustering & Live Migration, it was possible to physically move my servers from one datacenter to another without any interruption of service and without risking data. Since we implemented StarWind iSCSI SAN, we have found it easy to deploy, update, and maintain a service that is highly available from end to end. We know that we are protected against unexpected failures, and that StarWind support is there for us if any difficulties arise.